Our Weather Alerting service offers reliable severe weather alerts to organizations large & small across the country. Alerts sent within 20 seconds (or less!) from processing to delivery. Monitor for alerts down to the street address, or by ZIP code, county, or advanced geographic parameters. Fully geospatially-aware. Reliable platform with multiple points of redundancy. In operation for over 10 years. Receive alerts by text message, e-mail, automated voice call, app notification, Slack (beta), and more. Only receive the types of alerts you need. Choose from 50+ alert triggers from severe and winter weather to tropical storms. Only receive alerts when you need them. Great for limiting to shifts or work hours. Monitor one location or thousands*. We bill by users, and don't charge for each message unlike other services. * Surcharges may apply for certain formats. Set aliases for physical sites, facilities, store numbers, or other identifiers (e.g. "Distribution #0125"). We'll include them with each message in a list of impacted sites. 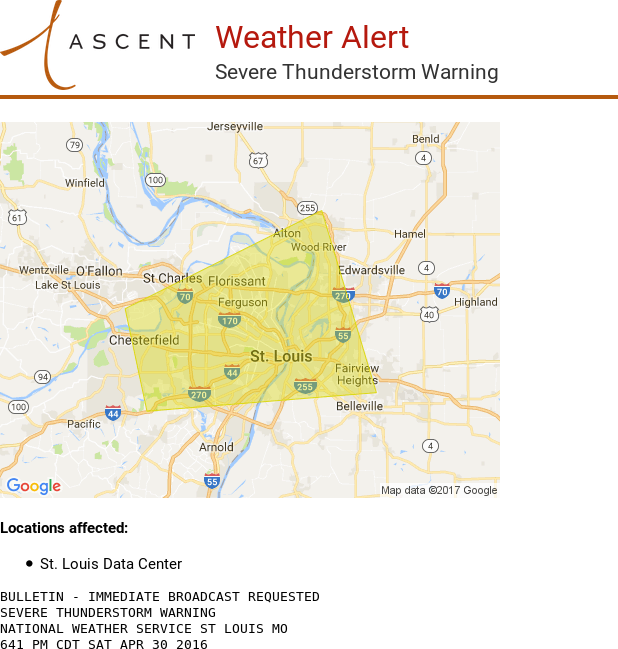 Severe alert e-mails include a map of the warned area and your location(s). Receive our text or email updates as soon as tropical storms form or strengthen. Manage your account users and alert triggers online. Receive alerts through our Push or Pull APIs in multiple formats. Use our platform with your logo, branding, and domain name. 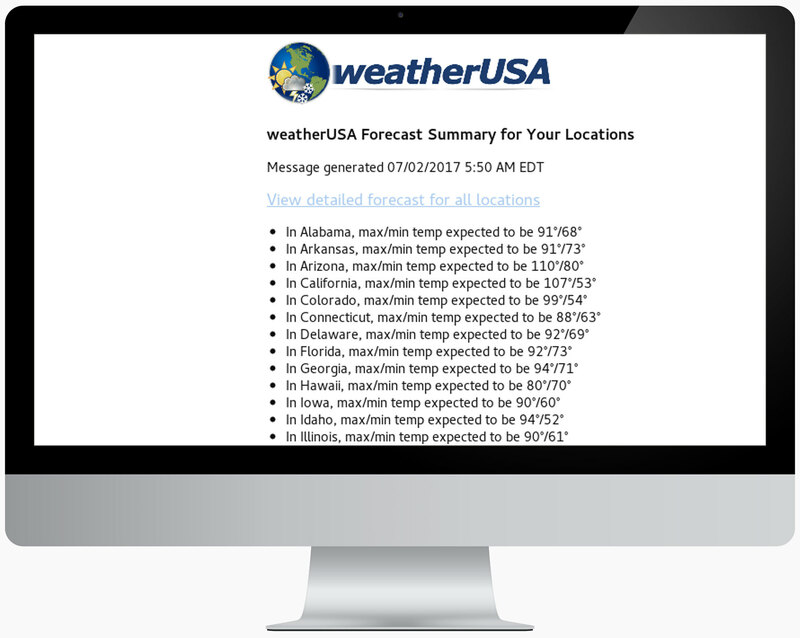 Use a fully customized e-mail template, display affected company facility names, send from custom e-mail addresses or set up your own shortcode to broadcast alerts. Provide a value-added service to your customers, operating on our reliable alerting platform and network without having to build out your own technology. Allow your employees, clients, or customers to configure their own alerts through your website or CRM, or via our web embeds. Add our customizable alert widgets to your website or intranet, showing only alerts that are affecting your locations or facilities. Weather maps with radar and other features can be displayed in the embed. Your team would be able to view a report sent at the same time everyday. Receive alerts for forecasted events, including high/low temperature, precipitation, high winds, snow, ice accumulation, and air quality ranges. Or, monitor nearby weather observations to trigger an alert on high/low temperature or heat index reached, high wind recorded, and more. Connect apps, back-ends, Internet-of-Things devices, smart homes, and other connected devices to receive the latest severe alerts in real-time. Developers and devices can connect to our alerting platform via ZeroMQ, SQS, or REST API. Alerts can be filtered by type or location using subscription identifiers. Our distributed architecture ensures reliable service and extremely fast (measured in milliseconds) relaying of notifications. Set of list of favorite weather locations. Monitor traffic and sky conditions near you.